As it's Sunday evening here in Suffolk I'll keep this post simple! Below is a list of the Stampin' Supplies and steps you'll need to take to make this card. 1. Create your card front in Whisper White Cardstock. 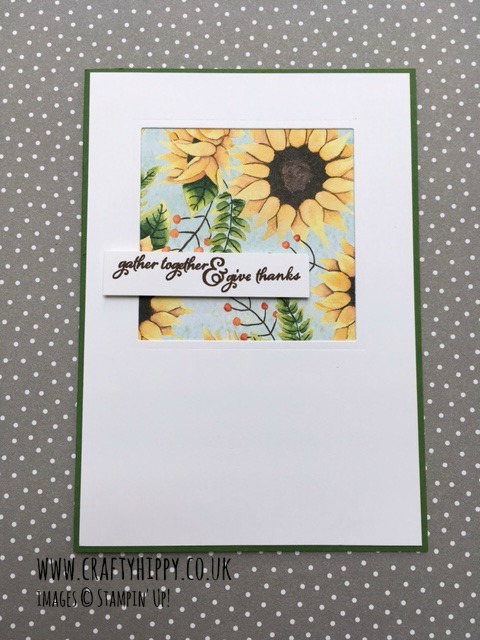 I used Garden Green Cardstock for the card base. 2. Cut out a square using the Big Shot Machine and the Stitched Shape Framelits Dies. 3. Cover the window using some Painted Autumn Designer Series Paper. 4. Stamp your sentiment (this one is from the Painted Harvest stamp set) in Chocolate Chip ink. 5. Assemble your card by using Snail Adhesive and Stampin' Dimensionals to elevate the sentiment. If you'd like to learn more about becoming a Stampin' Up! Demonstrator in the UK click HERE.